"Bluehost" Reviews (Apr 2019) - Why 4.9 Stars? Bluehost has a rock-solid reputation in the shared and WordPress hosting communities, and the host been a long-time favorite host of mine. Today, the company powers more than 2 million websites, and the team touts years of experience. With well-maintained servers, competitive pricing, and excellent support, Bluehost is hardly a pick you'll regret. “Bluehost has long been a favorite of mine in the shared and WordPress hosting spaces. The company adheres to modern standards for hardware, and its customer support is fantastic. Bluehost’s shared server options will accommodate the vast majority of customers' hosting needs for a web presence. Once you outgrow the traffic allowances of shared web hosting, however, Bluehost excels in the VPS and dedicated hosting niches, too. “If you’re looking for an affordable host, Bluehost is a solid, reputable choice; The company's low costs, coupled with its supremacy in the shared hosting arena, is what makes this provider such a valuable deal. The Bluehost name is listed toward the top of many of our reviews categories, and with good reason. The brand is known for excellent hardware configurations, a generous list of extras, and fantastic support and reliability — all at a price point that’s generally lower than the competition. “Built on modern technology, with a minimum of four cores per server, Bluehost offers reliable and flexible dedicated hosting options at an extremely reasonable price. We continually praise the company's shared hosting options for having fantastic hardware and a great management console, and the brand's dedicated server offerings are no different. “When comparing the performance versus price of VPS plans, Bluehost brings supreme value to the table. In addition to competitive pricing, the company offers premium support and excellent uptime compared with other VPS options in the industry. If you’ve outgrown shared hosting, or need the flexibility and security of a VPS, Bluehost is a great choice. “Aimed at personal bloggers and first-time users, Bluehost’s WordPress hosting packages are a great alternative to simple shared hosting. These service come at a premium, compared to Bluehost’s standard shared plans, but the WordPress optimization and platform-specific resources are arguably worth the cost. “With Bluehost, new site owners have the drag-and-drop simplicity of the Weebly website builder and goMobi mobile site builder at their fingertips. This makes launching a new online brand, store, or personal site from scratch relatively painless. Sure, site building has its headaches for newbies, but the Bluehost team is ready and willing to assist you every step of the way. With its long-term work in the hosting industry, Bluehost understands the significance of customer service. You can reach Bluehost support personnel and peruse its extensive knowledgebase 24/7. As one of the world's leaders in web hosting, Bluehost has built services on or using cutting-edge open-source technology. The company is endorsed by some of the most prominent and successful open-source projects on the planet, including WordPress.org. 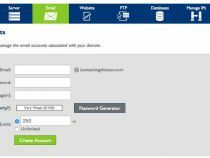 Bluehost has a custom domain manager that helps with domain transfers, purchases, tracking, and overall administration. Unlimited email accounts come with all shared hosting plans, along with POP3 and IMAP support and spam protection. Each account is backed up daily, weekly, and monthly, so you can revert your site to a previous condition should disaster strike. This is highly preferred to restarting your site's development, content, or design from scratch. As your site picks up steam, traffic grows, and (hopefully) revenue starts flowing in, your web host will ideally be equipped to help you perpetuate that growth. Upgrading from a shared account to a VPS or even a dedicated server is a painless process with Bluehost. 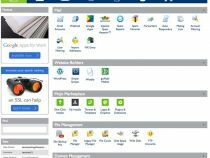 Built on cPanel, Bluehost has a custom interface that includes additional tools to simplify website and server management. Handle general administration, manage domains, set up email accounts, and access files from one simple-to-use dashboard. 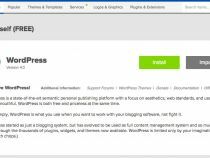 The host touts one-click installs of popular software programs, including WordPress, Drupal, Magento, and other applications. Price isn't the only factor you should consider when choosing a host. As new hardware, such as solid-state drives, come onto the market, you want assurance that your host has the bandwidth to accommodate these changes. Google and other search engines take your site's speed very seriously, and you should, too. The Bluehost team is highly aware of the performance ramifications at stake, and the brand wants its customers' sites to operate at screaming-fast speeds. You could probably find cheaper options out there, but you're not guaranteed the level of service and performance that Bluehost's reputation ensures. Bluehost has a modern, sleek company website, and that clean design extends to the platforms and interfaces customers use behind the scenes. Setting up a domain is simple, as is virtually any objective you tackle with Bluehost — whether you're installing WordPress with a single click or configuring your email hosting. For the level of service and performance that Bluehost offers, the company's price point is amazing. While some services are slightly more expensive than those of some other hosts, Bluehost more than makes up for it in features, reliability, and support. Bluehost has been in this industry since 2003. Having been acquired by the mega hosting conglomerate Endurance International Group, Bluehost is no doubt one of the leaders in the industry today. The company offers a 99.9% uptime guarantee, which is basically the standard in the industry. With more promising uptime rates comes higher price points, so Bluehost presents a bargain that balances cost with reliability. Wondering how Bluehost stacks up againt other web hosting services? See our host-vs-host reviews below and compare them side by side. 20 out of 25 times. Bluehost embodies performance, reliability, affordability, and user-friendliness — four of many tenets the team members pride themselves on delivering to customers. Having personally been a Bluehost customer, I can vouch for this company's commitment to the hosting community, and it's great to see the continued improvements to flexibility, speed, cost, and so on. This is a host you can trust as a novice, and Bluehost's services are the type with which you can grow your personal brand or professional site — from shared to cloud servers and beyond.